Currently the Consul-General at the US embassy at San Jose, Costa Rica, Mr. Candadai is an American diplomat, and has served for nine tours of Foreign Service. He was also, for a period of time, the Consul-General at the US Consulate in Chennai. 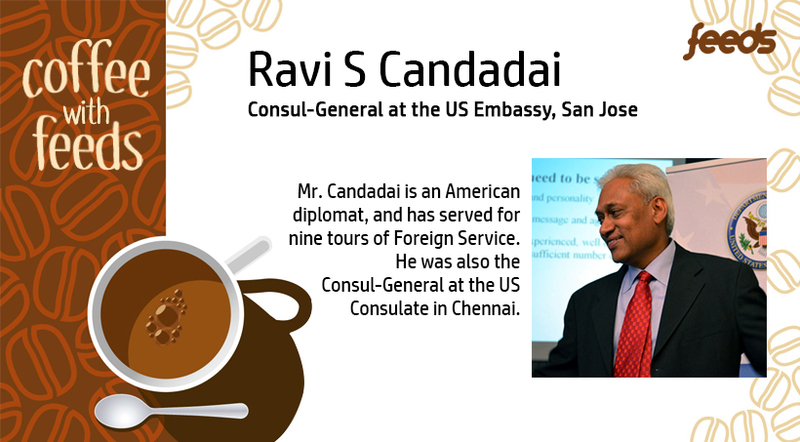 An accomplished speaker, who has seen much of the world, Mr.Candadai came down to NIT-Trichy, during the 2015 orientation programme to speak on ‘Authentic leadership in the workplace – An American perspective’, in a special interactive session. Feeds was able to avail a window of opportunity to have a brief chat with him, and was able to get him to share with us, some of his thoughts and experiences. As a diplomat, you often need to relocate and stay for extended periods of time in foreign environments. Does it get difficult? Do you miss home sometimes? This is my ninth tour of service in the American Foreign Service. Over the years, I’ve consciously made an effort to tell myself, that wherever I am; I’m at home. I felt that if I were to constantly spend time contemplating over the fact that I was far away from home, it would not get me anywhere. So, over the years, I’ve programmed myself, if you will, to keep attention focused on the work that I have at hand. So, how would one initiate the process of pursuing a career in diplomacy, or the Foreign Service? To represent the Indian government as an envoy, one must clear the IAS examinations, out of which a certain percentage of successful candidates go on to serve in the Indian Foreign Service. But, if one is looking for an international career, then I would advise them to start now, and look for opportunities to work for foreign firms which offer such exposure over the course of a career. I’m fond of the expression, ‘Doing it on somebody else’s dime’ which means, don’t pay for it; get someone else to pay you to do it. I would always advise one to pursue the cheaper and more sensible options. What should be, in your opinion, the attitude of students, in an increasingly competitive world? Remember that you are on your own. Exploit the opportunities from teachers and peers, as they are the ones who will influence your personality. Read; Keep yourself informed. Maintain a voracious appetite for knowledge. Be diverse in your interests. At the end of the day, engineering is just a part of who you are. What do you think of the current education scenario in India? It can be said without any doubt that Indian education produces quality alumni. But the average experience of an Indian student doesn’t compare fairly with respect to their counterparts in the world. The reason for this, is because of India’s greatest strength, which is also its very bane; population. The individualized attention that a student in most countries receives due to the limited numbers of their population, simply cannot be reproduced in India. The lack of properly functional facilities also is a contributing factor. The fact is that in India, students and teachers tend to work against the curriculum, which reduces the opportunity to explore other interests, whereas that is not the case in educational systems in other countries. Individualized instruction, seminar experiences from the primary level of education shape the students to jump into the real world immediately after they graduate. But in India, even the higher education doesn’t explore more and usually it is postponed to Master’s level making it a little late. Indian students wanting to pursue higher education abroad are steadily increasing. What global languages would you suggest that one should know, to possess an advantage over the crowd? German, for one is a language that I would say, is fast becoming an essential language that anyone hoping to pursue an international career should learn. Rather, I would say that one should look to analyze the opportunities that offer an international career and, learn that particular language which will help them further their careers in that field. So, that is the kind of approach that I think that one ought to have, when they wish to have an international career. Often, students in India tend to choose universities, for the name and recognition, ignoring other important factors such as the quality of the program. What is your opinion? The phrase that I would apply here would be ‘value for money’. Often, lesser known universities give you a better experience at a value for money. State universities such as University of Texas, Arlington offer excellent opportunities at a very good value. When I joined the Foreign Service, I found myself selected along with graduates from John Hopkins and Harvard, for the same job with the same salary, so I do not believe that I was at a disadvantage. What are the important qualities a leader should have? The foremost quality that a leader ought to possess is focus. Focus on objectives, on the process. Authentic leadership is influencing others. There is no one formula to become a leader. Effective leaders use their intellect and ability to motivate others to bring about a change in their surroundings. There is no set path to become a leader, only many avenues to choose from and to traverse using our own ability. How important is the support you receive from your family? 100% I do not believe that I would have got to where I am now, without my family. Their support was truly indispensable for me to have come far as I have. Could you share with us a memorable incident with a world leader? It was in Meenambakkam airport, March 2005. I was the acting consul-general at the Chennai Consulate, and had to receive the former president of the United States, Bill Clinton. Mr.Clinton had arrived to survey the extent of the damage caused by the Tsunami of 2004 along the coast, and as acting consul-general, it was my responsibility to brief him about the situation at that time. I had intended to make the briefing short, so as to not take up much of Mr.Clinton’s time, and I had actually expected to not have any time at all for a full-fledged briefing. However, Mr.Clinton was very considerate and asked me to take my time. He showed genuine eagerness to listen to even the smallest of details about the situation.